The human experience is sprinkled with joy, pain, hurt, love and loss. Along with the unpredictable nature of our experiences comes the instinctual inclination to avoid circumstances that evoke fear and pain and instead to seek opportunities for joy and pleasure. If we look more deeply into the challenging, difficult and even heartbreaking experiences that enter our lives, there lies a profound opportunity to reframe our perceptions and view each adversary we face as a possibility for further self-discovery. As we surrender to our challenges, we are able to discover just how strong we really are. In yoga, as in life, a shift in awareness can dramatically influence the depth of our experience. I became aware of this truth as I faced the challenging urdhva dhanurasana, or backbend pose. Each time I attempted to enter the pose, a fearful response welled up from within my body. Wanting so desperately to successfully execute the perfect backbend, my self-imposed expectations and fear of failure began to gnaw away at my confidence. I would start by lying on my back with my knees bent. Moving my elbows into place with the palms of my hands on the ground above my shoulders, I struggled to push up with my arms and legs. Try as I might, I could not get my torso off the ground. After tedious months of practice, I could finally get into position on my own. After all this work, I found getting into the pose was relatively simple compared to holding it. In holding urdhva dhanurasana, I would consistently experience an intense heat radiating from my body as I would fight to keep my balance. Struggling to take slow, deep breaths, I would become exasperated as my tight chest could only offer short bursts of air. As each minute passed, I found it harder and harder to hold the pose. Just as I was ready to give up on my body, my teacher interjected, “Try to find the ease within the effort.” Where could there be any ease within all this effort? If I let go, I knew I would lose control and fall. However, as my resistance began to fade, an answer emerged. Perhaps it was the effort itself preventing me from fully experiencing the asana. I knew there must be a place between the limpness of a lifeless attempt at achieving the pose and the rigidity of strenuously pushing myself into position. Therein was where I needed to find the space to breathe! During a particularly difficult day, I attended class while suffering from hay fever. 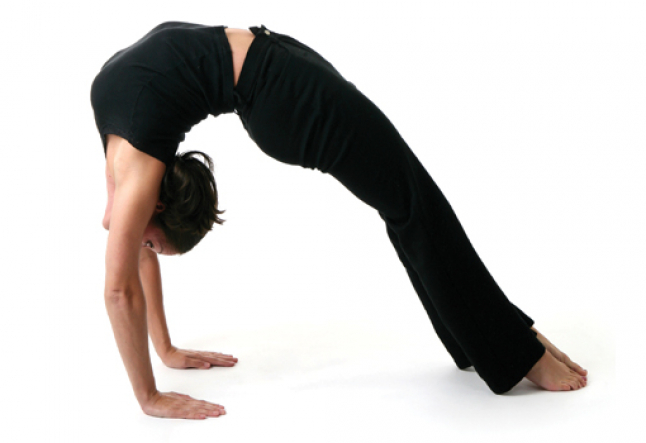 Many asanas alleviate allergy symptoms, but backbends tend to aggravate them. As the class prepared for backbends, I laid wallowing in self-pity, knowing this backbend would not be my best, but I pulled myself together and inhaled deeply. On the exhale, I pushed up into the backbend. As I held the pose, I noticed a different sensation. Because I was not occupied with achieving the best possible pose, I had found the space to breathe deeply. I was able to feel where my spine was spacious and where it was compacted. In working through my fear, I was able to become completely aware of the details surrounding me. I could appreciate the physical qualities of the room and the rich color of the hardwood floors beneath me. My awareness flowed beyond the window and encompassed the street outside of the studio, where I could hear conversations and even sense the moods of people passing by. I had finally found that illusive place between engaging my mind and body in something worthwhile and relaxing enough to open up to the present moment. It can be easy to lose perspective in the moment, especially when we are striving to deepen our practice and achieve the perfect pose. Focusing in on a small aspect of the overarching experience has the ability to skew our perspective and ultimately distract the mind and the body. We miss experiencing the totality of the present moment. I am grateful for all of the teachers who have reminded me to ease through the effort. I strive to bring this awareness with me every time I hit the mat and to cultivate similar clarity as I approach each part of my daily life.